In the era of digitalization it would not be wrong to say that mobile phone has become an integral part of human lives. More than half of the world population owns at least one mobile subscription. But not necessarily all the mobile owners have smart phones because many of the mobile owners still uses the basic feature phone. And one thing that is common in all types of mobile phone is the text message services. After calls, messages are surely the second most commonly used feature in mobile phones. Being among the most preferred way of communicating, SMS today is considered as an important tool of communication. Many businesses and companies have started using it under various digital marketing strategies. But when using it for marketing and promotions, one need to be very particular while choosing the SMS marketing platform. So, Here We Are Giving You Few Tips That Can Help You Pick Best SMS Marketing Platform. Every SMS marketing platform provider has few options to choose when they are choosing the routes for sending the SMS. Where on one hand “Tier One connections” are considered as legitimate connections for mobile networks promising 100% delivery, on the other hand the “grey routes” could bounce your messages to avoid paying connection fees. And worst of them all is “SIM farms” which uses unregistered SIM to send messages, thereby making all your messages just the spam. • Do They Offer Other Functional Features Too? A good SMS marketing platform provider offers a range of product versatility to transform every message campaign into a successful story. By offering various other tools like: contact group management, analytics, vast coverage, options of scheduling etc. So, pick the one that can let you do more besides just offering SMS sending services. No matter how user friendly the platform is, it is very important that they offer genuine, 24X7 customer support services. It could include call support, assistance through email or chat. Besides this, never fall for a platform that offer free services as they actually trap you in web of poor services only. But never miss to ask for free trials before selecting any paid SMS platform services. Among the mentioned points will surely help you get in touch with the best SMS marketing platform. 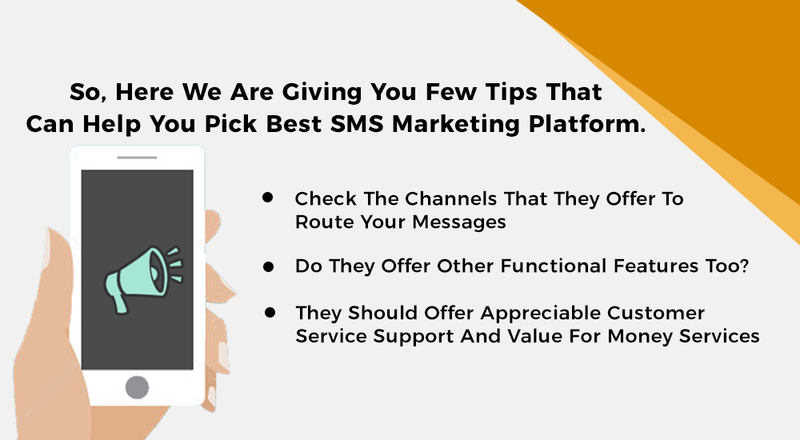 Make sure you consider them as the right platform can help you maximize the results of your SMS marketing.